Any non-native English speaker admitted to the university may take ESL courses. Special students and exchange students may be allowed to take ESL courses when space is available. Most new and transfer undergraduate students must take the Madison ESL Assessment Test (MSN-ESLAT) and enroll in the recommended ESL courses until they have completed English 118. 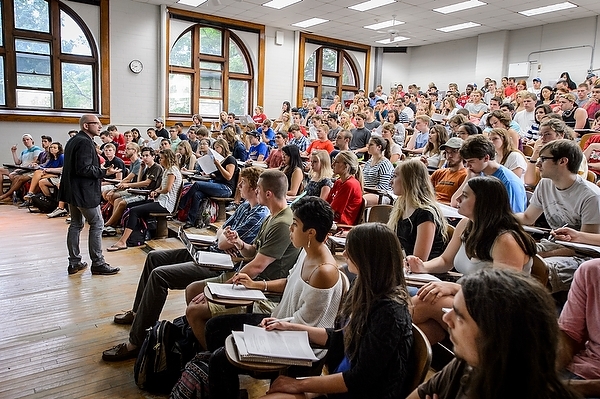 English 118 fulfills the Comm A communication requirement for undergraduates. After a student has taken an ESL course, instructors re-evaluate the student’s English language proficiency and recommend further ESL courses as needed. It is not necessary to take all the courses in the ESL sequence of 114, 115, 116, 117 and 118. Students may move from 115 directly to 117, for example. Most ESL courses are 3-credit courses. Undergraduates receive credit for all ESL courses. Graduate students with a TOEFL score below 93 on the iBt or below 580 on the paper-based TOEFL must take the Madison ESL Assessment Test (MSN-ESLAT) upon arrival. Some departments require the MSN-ESLAT regardless of TOEFL score. Graduate students should enroll in the recommended ESL course in their first semester based on the recommendation determined by their MSN-ESLAT test. Taking the recommended course will fulfill the ESL requirement for most students. Students may wish to work further on their English. People who want to enroll in ESL 344 (Graduate Academic Presentations), 345 (Pronunciation for International Grad Students, 349 (Writing for International Grad Students) or 350 (Professional and Academic Writing Skills) may do so without taking the MSN-ESLAT. See Course Descriptions for Academic Classes to find out if one of these classes meets your needs. ESL courses do not count toward the degree for graduate students.